The first time I tasted Malai Curry was in a frozen meal and I liked it. It was so good, in fact, that I had to find out how to make it. India is brimming with variety in every sense of the word and sets the scene for new experiences. Food brings people together in celebration. Perhaps even the most arduous negotiation between old enemies can end with a big pot of Malai and ice-cold Kingfisher. I t’s now 9 o’clock and not a creature is stirring. Daisy is asleep here next to me and, for once, we have the bed all to ourselves. Shawn built this big California King many years ago. (Stop me if I’ve already told you this story. I seem to repeat things these days.) We usually share it, not only with our daughter, but with both dogs. You would think there would be plenty of room for all of us, but I somehow always end up teetering on the edge, even now that it’s just the two of us. It’s me-time, and I relish in putting my feet up, wandering online for culinary inspiration. In thinking about my child’s future, I’ve been looking at the past, how my grandparents lived and what life was like in their homes so long ago. As I get older, I find myself reaching for a wooden spoon and bowl more often that my fancy stand mixer. The kitchen is my haven, where I go to detox and refresh, escape the noises in my head. While a back-to-basics approach is very appealing, there are some ventures I deem ridiculous, like making butter at home – that I’ll leave to the pros, especially since cream is precious and best saved for cakes and sauces, like Malai Curry, an aromatic, velvety concoction with a coconut base spiced with garam masala and fenugreek. A wise woman once said If you’re afraid of butter, use cream. Butter is one of the best bits of happiness Life has to offer and I simply refuse to give it up. Good food does not come from expensive ingredients and highly complicated methods. The tastiest recipes incorporate just a few simple things and butter. My Gujarati connection refers to all saucy things as a curry. Proper curry is not the yellow powder with a turmeric and cumin base. Malai means cream in several languages spoken in India. I’m told that restaurants use heavy cream to make a sauce that is more rich than the homemade version. You mustn’t fear butter or cream, but if you are watching your waist, use coconut milk, instead. I did. Julia will never know. Cashews, coriander, cardamom, cinnamon, ginger and bay leaves come together in an aromatic sauce that is impossible to resist. The essence of ground spices quickly dissipates, but whole spices have a longer shelf-life, so I like to make my own garam masala by toasting whole spices, then grinding them up in a little coffee grinder. It infuses incredible flavor and I take pride in having made it from scratch. Malai Curry is traditionally vegetarian served with kofta, meatless meatballs made with potatoes and paneer similar to cottage cheese. It’s rich and silky, beautiful with chicken or shrimp served over Mom’s fluffy rice. You can easily skip the meat altogether since the sauce is loaded with cashews. This recipe is very versatile in that it’s easy to make vegan, paleo and dairy-free. There are a few sauces that are just so delicious, I could literally just eat them with bread and nothing more. Bearnaise is one of them and Malai Curry is the other. 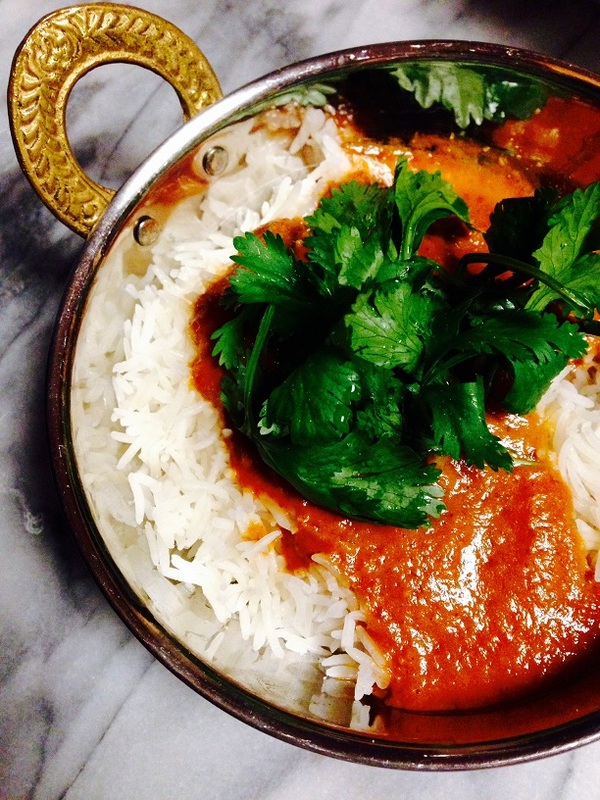 Fragrant, nutty, buttery with a beautiful terracotta clay hue, this sauce is my go-to recipe for weeknight Indian food made at home. Rushing is not my style, especially in the grocery store. I like to take my time, strolling up and down every aisle, planning our next meal. Alas, reality is not always so kind and, after a long day trapped in my cubicle, I find myself navigating the slippery tile floor in heels, struggling to not get distracted by some new and exotic (dragonfruit) and forgetting to get the very reason for my stop at the market (milk). Daisy and I have karate on the same nights, an hour between classes. While Shawn takes her to her lesson, I slip into my apron and cook dinner. This is hardly the time to take on anything ambitious, like making pesto by hand with a mortar & pestle. Who would do that? Last night it was Malai curry, from scratch. Spices lay the foundation to any good sauce and, since ground spices loose flavor fairly quickly, I roast mine whole in a dry pan, then grind them in a little coffee grinder. Before I knew it, my kitchen was brimming with the warmth of cinnamon, cardamom of garam masala and the trademark fragrance of fenugreek. Fenugreek has made its name in the West only recently among new mothers for its potency to help with milk production, while it has held its post in Eastern kitchens for centuries. Classic Persian recipes call for it by its melodic Farsi name shambalileh and it is compulsory in authentic Ghormeh Sabzi. Some claim eating fenugreek makes one smell like maple syrup. You know what I say? Bottle that stuff up. I’ll take it! The garam masala can be made ahead of time, but this recipe hits the table in less than an hour and tastes like you spent days in the kitchen. Whether you choose cream or coconut milk, Malai Curry spins a whirlwind of flavor, each spice chiming in almost poetically. Earthy and comforting with a rich terracotta orange hue and gentle warmth that echoes Fall, it draws rave reviews even from little ones. Daisy practically licked her bowl. This curry looks incredible – I can imagine how amazing the house would smell with all those aromatic spices!